LOINC Premium Members have exclusive access to our new LOINCinar series. 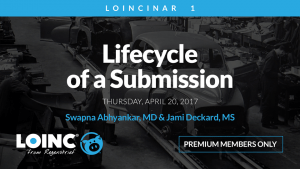 A LOINCinar is an interactive webinar covering all things LOINC. They are a great opportunity to learn more about LOINC, ask questions, and hear directly from our team of experts. LOINCinars are offered regularly as 60-minute live events covering a variety of topics. Each session offers in-depth explanations and allows plenty of time for your questions. Our goal is for you to succeed with LOINC. We will be announcing our next LOINCinar in the near future. LOINC Premium Members, watch your email for details and how to RSVP. With over 84,000 terms in the LOINC database, efficient search techniques are essential for quickly finding the terms you need. 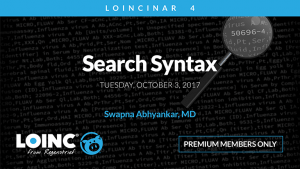 In this LOINCinar, we provide you with numerous tips and tricks to improve your searches and save you time whether you are using RELMA or search.loinc.org. Our expert recommendations will also help improve your mapping accuracy. 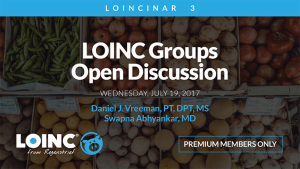 The third LOINCinar provides a brief overview of the newly released LOINC Groups Alpha 1 file including structure and potential use cases. The balance of the session features questions and feedback from the community with responses by the LOINC development team. 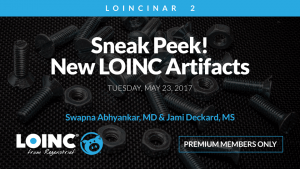 Our second LOINCinar provides an overview of all of the new files included in the June 2017 LOINC 2.61 release. We discuss the format and contents of each artifact, including the LOINC Table Core, Part File, Answer File, and Group File. All of these files are now available for download. This first LOINCinar explains how we process submissions, from our first look at the information you send through the creation and publication of new codes. It's your backstage pass that will give you a better understanding of our content development and QA workflows.